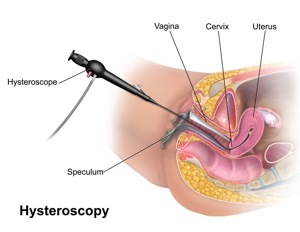 When is a hysteroscopy carried out? A procedure called dilatation and curettage (D&C) used to be commonly used to examine the womb and remove abnormal growths, but nowadays hysteroscopies are carried out instead. A hysteroscopy is usually carried out on an outpatient or day-case basis. This means you don’t have to stay in hospital overnight. It may not be necessary to use anaesthetic for the procedure, although local anaesthetic (where medication is used to numb your cervix) is sometimes used. General anaesthetic may be used if you’re having treatment during the procedure or you would prefer to be asleep while it’s carried out. How is the recovery following a hysteroscopy procedure? Mr Chattopadhyay will discuss the findings of the procedure with you before you leave hospital. A hysteroscopy is generally very safe, but like any procedure there is a small risk of complications. The risk is higher for women who have treatment during a hysteroscopy. These alternatives may be performed alongside a hysteroscopy, but do not provide as much information and can’t be used to treat problems in the same way as a hysteroscopy.